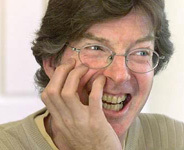 In December 1998 Phil Lesh had a liver transplant. His surgery and recovery were a huge success. We owe thanks to the Mayo Clinic (in Jacksonville, FL, one of the best transplant clinics in the country), Dr. Steers (innovator in techniques of liver transplants and chief surgeon for Phil's surgery), the HVC Global Foundation (grassroots Hepatitis awareness organization), the loving family and their deceased who made the organ donation, and to the fans and family who came together with love and healing energy. And we thank Phil Lesh for remaining comitted to raising our awareness of organ donorship and other health issues related to Hepatitis. As Phil has reminded us, it is very important to notify your family, preferably in writing, of your desire to be an organ donor (in addition to putting the pink stamp on your driver's license or whatever it is in your state).
' 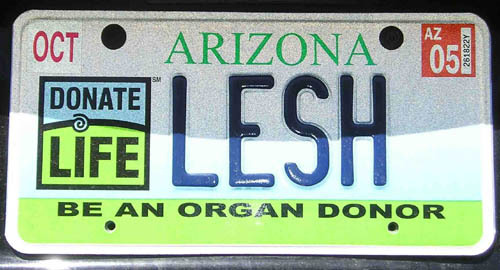 In the event of my demise it is my irrevocable desire to be an organ donor '. 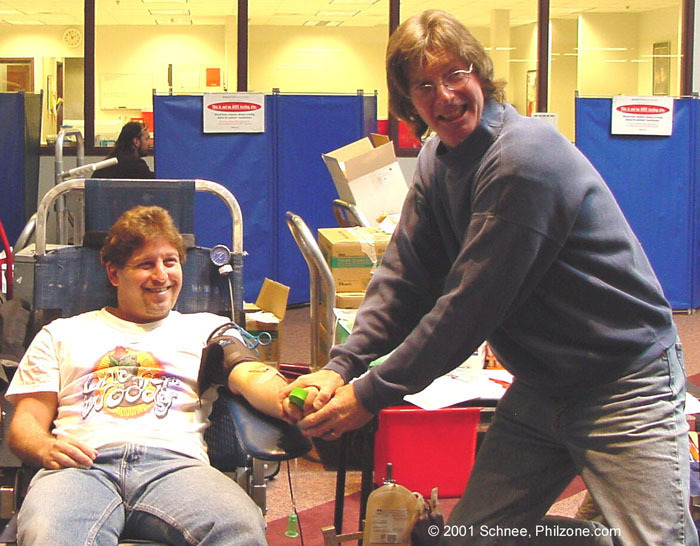 Phil Denver Blood Drive - Huge Success! Organ Donation For Jews - It Is Ok! 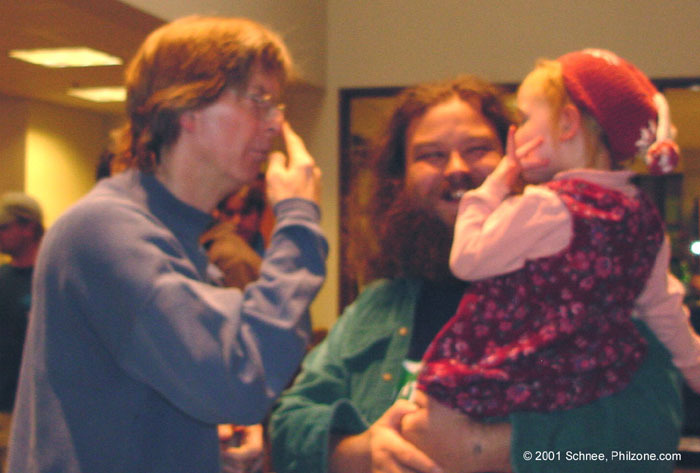 Phil Lesh, former organ transplant recipient, has been on a crusade to promote the urgent need for blood and organ donations. Phil has been raising awarness by visiting local blood centers throughout the nation and encouraging fans to donate blood. The Phil & Friends Blood Drive on February 10th at the Bonfils Blood Center in Denver, CO was a huge success thanks to PHIL-heads like you! Phil spent the afternoon at Denver's community blood center meeting fans and signing posters to show his appreciation and support of blood donors. The previous record of 77 pints of blood donated during a Phil blood drive was broken this Saturday in Denver. About 251 people were present to donate with 191 units actually donated! All blood donors received a signed poster by Phil Lesh. 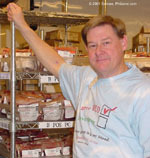 www.bonfils.org or a local blood donation center in a city near you! I'd like to thank you all for coming out tonight, we've been having a great time on this tour. It's unfortunate this is the last one - we've been having a really good time. I'd like to speak to you all about something kind of serious. I'm only here because I had an organ transplant earlier (the end of last year) and the people who were noble and generous enough to OK the organ donorship of one of their loved ones had to go through a really traumatic experience. 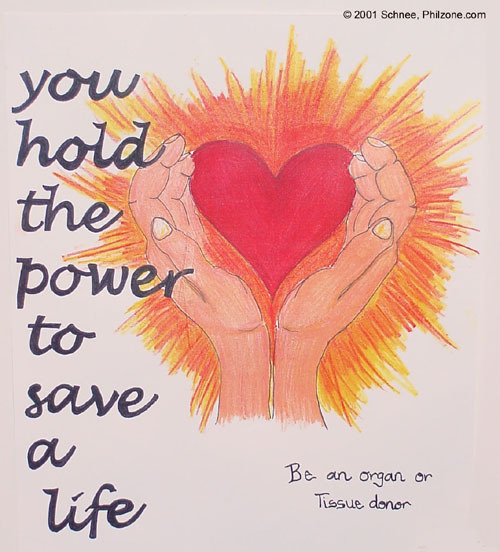 I encourage everyone who is interested in becoming an organ donor and really has a desire to give in the case of their demise not only to become an organ donor, and not only put the stamp on their driver's license, but to notify your family. you and are close to you (who will be completely traumatized, it will be a tragic occasion). If you have written out something for them saying "I really want to be an organ donor just in case of my untimely death". Then that would make that decision so much easier for them. So all I can say is I bless the folks that did it for me. Please be an organ donor and give blood. Thank you. permission, by making the donor cards legal documents that carry more weight than a drivers license or unofficial donor card. It is one element of a plan that Tommy Thompson, secretary of the Health and Human Services Department, plans to make public later this month, according to an agency official speaking on condition of anonymity.It also is likely to involve a media campaign, an effort to work closely with businesses and states to promote donation, and new ways to encourage increasingly popular living organdonations. In addition, the budget President Bush is sending next week to Congress will include an additional $5 million for organ donation and transplant activities, an increase of 33 percent. Since taking office, Thompson has talked regularly about organ donation, prodding his audiences to sign donor cards. Its odd to me that in America, this most compassionate country in the world, we have so many people that are dying because of lack of organs, he told reporters last week. and for donors to specify which organs they wish to donate and whether they want to include tissue and eyes. The idea is to give the documents more legal weight and to prompt families to discuss the issue in a manner worthy of a legal document, officials said. Anything that prompts discussion is likely to be helpful, said Susan Gunderson, president of the Association of Organ Procurement Organizations and director of a Minnesota organ bank. Most families that know their loved ones wishes are likely to honor them, she added, but the new donor card could break the tie in families that disagree about whether to donate. Federal officials say the cards would supplement, not replace, the donor cards that now exist, and could become a model for states or others that wish to adopt them. They would be handed out at events where donation is promoted through other parts of the initiative. Nov. 16, 2000  The nations organ transplant network is set to approve new rules for distributing scarce livers aimed at making sure the sickest patients are truly at the top of the waiting list. But the proposal being considered does nothing to break down geographic barriers that keep most organs in the communities where they are donated, even if theres someone sicker in the next city or state over. Rather, it would create a more precise scale for determining how sick waiting patients are, allowing the network to direct more livers to the sickest patients. The United Network for Organ Sharing, which is expected to endorse the new plan today, must submit its proposal to the Department of Health and Human Services for approval. HHS officials, who have been demanding more sweeping changes, said they are prepared to accept the proposal, at least for now. The problem comes down to supply and demand. In 1999, there were 4,698 liver transplants performed, but 1,753 people died waiting. More than 16,000 liver patients are waiting today. Transplant centers, which depend on a reliable stream of donated organs to run their programs, also have an interest in maximizing the number of organs that come their way. A network committee considered 17 plans for sharing livers over broader areas and a majority concluded that none of them would save a substantial number of lives, said Dr. Richard Freeman, a liver surgeon at Tufts University who chaired the committee. One proposal, he explained, would have saved only about 20 lives per year, which he called a drop in the bucket. But broader sharing is what the HHS has been pushing since early 1998, when Secretary Donna Shalala dramatically declared that patients are dying simply because of where they live. After Shalala issued her regulations directing the network to break down geographic barriers, HHS and the transplant network plunged into outright battle over the best way to distribute organs. In the end, it appeared as if HHS had won. Its regulations took effect after several congressionally imposed delays. And faced with competition for the job of distributing organs, the network agreed to a new contract that spelled out every detail of the regulation. Now the network is required to submit a new plan for distributing livers, and it has stuck with its initial position against breaking down sometimes arbitrary geographic lines, much to the dismay of some patient groups. Is HHS Skirting the Issue? Once again theyre skirting around the issue of distribution, said Craig Irwin of the National Transplant Action Committee. The network does propose a major change in the way waiting patients are ranked. Patients are now grouped into four broad categories. Within each group, the length of time that a patient has been waiting determines who gets the liver. But many transplant experts believe waiting time is a poor measure of the severity of illness. The new policy would still give first chance to Status 1 patients  those who become suddenly ill and are expected to die within a week. Everyone else would get a number, with the highest numbers for the sickest patients. Patient scores would be determined by a combination of medical factors including the bodys ability to form a blood clot; the ability to break down the hemoglobin; and kidney function, which can be affected by a failing liver. The system, developed by the Mayo Clinic, is known as MELD, for Mayo End-stage Liver Disease. HHS officials say they will wait to see how the new severity scale functions before demanding that the network reconsider the issue of geographic boundaries. It was impossible to run computer models on broader sharing under this new system because there is no data yet on which patients would be affected, said Lynn Wegman, director of the Division of Transplantation. There should be enough data in a matter of months to return to the issue, she said. Other organs are also distributed along geographic lines, but livers have engendered the most controversy. Thats because patients whose livers fail have no other options, and donated livers can survive outside the body for 24 hours before transplantation, meaning they can be safely transported to other parts of the country. New system seeks to end struggle over how the scarce resources are allocated. Full Senate approval seen soon, then meetings with House. WASHINGTON April 13, 2000 -The Clinton administration has crafted an agreement with key senators on legislation to revamp the nation's organ transplant system, pointing the way toward an end to the contentious two-year struggle over who decides how these precious resources are distributed, senators and administration officials said Wednesday. The compromise measure, hammered out late Tuesday night among administration officials and Sens. Bill Frist (R-Tenn.) and Edward M. Kennedy (D-Mass. ), was approved unanimously Wednesday by the Senate Health, Education, Labor and Pensions Committee. It will be sent to the full Senate for a vote after next week's congressional spring break, where it is expected to be approved. The legislation differs, however, from the House bill passed last week--a version President Clinton has promised he would veto--and differences will have to be resolved in a House-Senate conference committee. The Senate bill "will help to balance the difficult ethical and medical decisions that accompany decisions about how organs are distributed," said Frist, who was a transplant surgeon before being elected to the Senate. The compromise, he said, "is in the best interest of all patients because it focuses on developing new policies based on scientific data, medical principles and equity." Health and Human Services Secretary Donna Shalala said that the compromise, if enacted, "would provide a sound foundation for moving toward a better, fairer" system. She acknowledged that "no single party achieved everything it wanted" with the Senate bill but that it represents "a day-and-night improvement" over the House measure. But the House Commerce Committee, which wrote the House version, called the Senate bill "misguided" and a thinly disguised White House plan to give Shalala more authority. Committee Chairman Thomas J. Bliley (R-Va.) remains "committed to providing the best protection for organ transplant patients," it said. The Senate legislation skirts the most divisive issue: the argument over how to distribute scarce organs. But it sets up a mechanism to resolve fights between the federal government and the United Network for Organ Sharing, the private contractor that runs the system, by establishing a panel of outside experts to mediate future disputes. The current controversy arose over the administration's attempt to change the organ network's policy of distributing organs in local areas first before offering them regionally and then nationally. Shalala's department sought to ensure that the sickest patients received organs first, regardless of where they live. The House bill, siding with the network, would remove transplant oversight from HHS and give it to the network. Under the Senate bill, however, the outside panel would have the authority to make final decisions on policy, based on guidelines set into the law. The panel--made up of 21 experts, such as surgeons, clinical researchers and medical ethicists--would be chosen by the HHS secretary, the transplant network and the Institute of Medicine. Moreover, those guidelines would require development of a policy that would seek to reduce disparities in access that result from geography--a requirement representing a compromise with the administration, which sought to eliminate the disparities. The Senate bill essentially would permit the organ network to write allocation policy but would permit the committee of experts to intervene if the government disagrees with the private contractor. The panel would have the final word, based on the guidelines. "This is not an easy issue to wrestle with--there aren't any evil people involved in this who are trying to do bad things," said Mark Rosenker, the network's managing director and assistant executive director for external affairs. "Everybody wants to do the right thing. We all just have different ways of getting there." 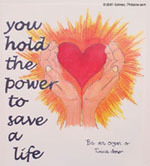 The issue has commanded increasing attention at a time when the nation is experiencing a crucial shortage of organs. Every day, according to medical estimates, 12 Americans die while waiting for an organ, and about 68,000 people are waiting for transplants at any given time. Simultaneously, advances in transplantation have made the medical procedure increasingly successful, putting even greater pressure on the organ allocation system. October 3, 1999 - Dallas - Robert Pennington believes he's alive today because of a pig that his family calls Wilbur. The 19-year-old suffers from liver disease. His name was put on a transplant waiting list, but no livers were available. Then Dr. Marlon Levy, a transplant surgeon at Baylor University Medical Center, offered an alternative: a procedure using a dead pig's liver. But not a liver from an ordinary pig. "They're genetically modified to try to prevent a reaction between the human blood and the pig liver," Levy said. Pennington didn't actually have the pig's liver transplanted into his body. Instead, his blood was run through the pig's liver in a procedure called xenoperfusion. A tube was placed in a vein in Pennington's leg, and his blood was siphoned through a pump. The blood was heated, oxygen was added, then the blood was filtered through the pig's liver and returned to Pennington's body. "I think it's impossible to say whether they would have lived long enough to receive their liver (transplant) had we not had this bridging technology," Levy said. "But I'd like to think that made the absolute difference in their survival." The pig liver was used to temporarily keep Pennington alive until a human liver became available, but surgeons at Baylor hope to one day transplant pig livers into humans. There is concern, though, that humans could pick up a virus from pigs. "We need to have animals genetically altered to the point where we believe we do not see an immune response of that dangerous kind," said Dr. Goran Klintmalm, director of transplantation at Baylor University. "The promise of xenotransplants has been around for many years, and still has not been fulfilled," said Dr. Achilles Demetriou of Cedars-Sinai Medical Center. "My guess is it will not be fulfilled in the immediate future." Demetriou has been working on a device he calls a bioartificial liver. It would use cells from pig livers to remove toxins in a technique similar to kidney dialysis. After sudden liver failure due to medication poisoning, Molly Koch, was put on the device for two days until a human liver became available. "I wouldn't be here right now if it wasn't for the machine," Koch said. Doctors at Cedars-Sinai have used the machine on 26 patients, and 23 still are alive. Demetriou said there was an unexpected bonus. "We did find in about six patients when we kept them alive for several days, their liver recovered spontaneously so they actually got better without the need for a transplant," Demetriou said. Last year in the United States, there were more than 13,000 people on waiting lists to receive liver transplants. Fewer than 5,000 received new livers; many others died while waiting. Many doctors believe that even if more donors become available, the real solution to ending the organ shortage is animal-to-human transplants. And they believe success stories like Pennington's and Koch's indicate that could become a reality in the next decade.